High throughput approaches to experimentation have been applied to diverse science and applied domains, from drug discovery to stem-cell research and tissue engineering. Two of the most notable challenges are (1) the inability for existing approaches to effectively extract information from a space of the desired dimensionality, namely 3D+t, and (2) the inability of existing software to efficiently deal with big data that are rapidly gathered from high-content, high-throughput robot-driven imaging systems. We have designed an image characterization platform to address these challenges, to facilitate the translation from information to knowledge, in order to accelerate research and improve productivity. Tissue engineering has enormous potential in organ repair, personalized medicine and drug development, which has been substantially enhanced by the recent invention of induced Pluripotent Stem Cells. However, the challenges are finding the right combination of biomaterials that can direct stem cells to definitive tissue endpoints. Timely understanding of the causal relationship between the significant range of experimental conditions being explored and the resultant differentiation outcomes is key to success. Critically, this requires high resolution, quantitative assessment in terms of imaging and analysis, in a rapid timeframe, to find our ‘hits’ that can be further explored. Such image analysis tools do not exist commercially. The challenges of this project span investigating suitable methods for aggregate quantification, developing customised descriptors to describe biologically meaningful features using image analysis, as well as processing the enormous data volumes produced. 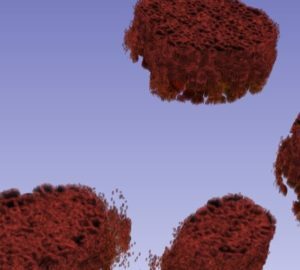 Measurable objectives include visualization and quantitative analysis of the 3D stem cell aggregates using statistical measurements, characterization of both the aggregates, individual stem cells and their nuclei, and development of an exploratory tool for characterising stem cell differentiation outcomes. We are developing a high throughput image characterisation and visualisation platform for the tissue engineering experiments. We have developed new image analysis algorithms, workflows and software tools for automated analysis of 3D stem cell aggregates. These outputs will be exploited both internally in CSIRO and externally through active engagement with applicable industry partners. 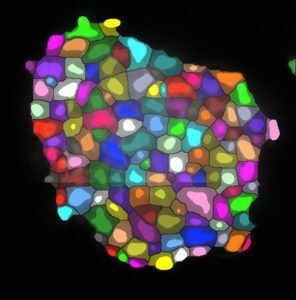 The high throughput image characterisation and visualisation platform can be used by biomedical research institutes to analyse the 3D stem cells and their aggregates, and interactively visualise them. The platform can be potentially used in drug discovery for pharmaceutical industry, in tissue engineering for the high-throughput biomaterial discovery for large scale manufacture of functional human micro-tissue units or organs, in the material characterisation for the new material discovery etc.